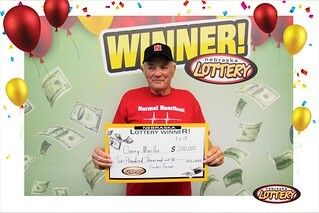 Garry Lee Mueller of Fremont won $200,000 playing the Flawless Fortune Scratch ticket from the Nebraska Lottery. Mueller bought his winning ticket at Quik Pik #22 at 2010 Bell Street in Fremont. Mueller has won big before, having taken home a $10,000 prize and four $1,000 prizes in the past, but this tops them all. Even after winning so in the past, scratching off the winning ticket still came as a big shock, he said. “I just about fainted,” Mueller said. Mueller said he brought his ticket back to the Quik Pik he bought it at, just to make sure it was a winner and after she scanned the ticket, Mueller said the clerk was shaking as she handed it back to him. Mueller’s planning on paying off his house and maybe buying a new car with his $200,000 winnings. He bought the ticket on the evening of September 5 and came to Lincoln to collect his prize on September 6, which made for a super long night, he said. “I couldn’t hardly sleep last night,” Mueller said. As a $20 Scratch game, Flawless Fortune offers players a chance to win prizes from a free ticket to $200,000. The chances of winning $200,000 are one in 240,000, while the odds of winning any prize are one in 2.68.